• As expected Scott Baker underwent surgery yesterday to repair the flexor pronator tendon in his elbow, but while he was under the knife Dr. David Altchek discovered ulnar collateral ligament damage and performed Tommy John surgery as well. Apparently the torn UCL didn't show up on the initial MRI exam or last week's follow-up version, so instead of a six-month recovery timetable Baker will likely be out for 12 months. So in the span of two weeks Baker went from having an MRI exam that the Twins described as "good news" to needing "cleanup" surgery to undergoing Tommy John surgery. I'm of the opinion that there was never any chance of the Twins exercising his $9.25 million option for 2013, but now that isn't even a consideration. And at this point any injured Twins player who doesn't seek a second opinion from someone outside the organization is an idiot. 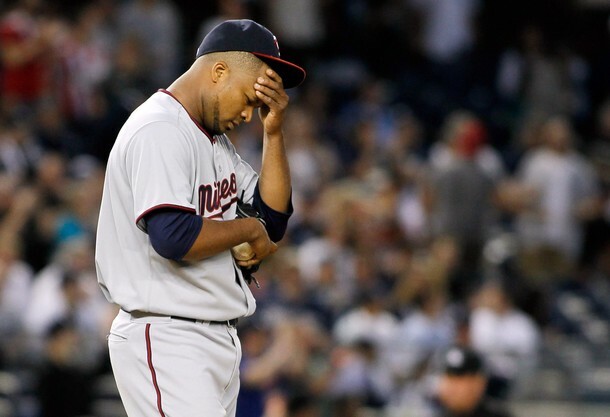 • Francisco Liriano turned in his third straight clunker last night, failing to make it out of the third inning. Through three starts he has an 11.91 ERA and .407 opponents' batting average while throwing 138 strikes and 103 balls. It's become increasingly popular to say that Liriano's struggles are mental and I'm sure there's plenty of truth to that narrative, but it's also worth noting that his raw stuff is simply nowhere near as good as it was in 2010, let alone in 2006. As a rookie Liriano's average fastball was 94.7 miles per hour and in 2010 it was 93.7 mph, but since the start of last season it's 91.6 mph. It certainly isn't shocking that a one-time power pitcher would lose confidence as his velocity vanishes and his fastball becomes far more hittable. Perhaps it's a chicken-or-egg scenario and there's no doubt that he's failed to make adjustments, but to suggest that his collapse is entirely mental seems way too simplistic. • Glen Perkins hopefully won't follow Baker's progression from optimistic diagnosis to career-altering surgery, but he underwent an MRI exam on his forearm after coughing up the lead Sunday. No structural damage was found and he's avoided the disabled list ... so far. Dating back to his final 20 appearances of last season Perkins has a 5.56 ERA in his last 23 innings, although that includes 24 strikeouts and his velocity hasn't dipped. • Miguel Sano is off to a huge start at low Single-A, homering yesterday for the fifth time in 12 games. Despite being the sixth-youngest player in the entire Midwest League and not turning 19 years old until next month Sano is hitting .256/.408/.692 and has already drawn nine walks after a total of just 23 walks in 66 games last season. Kevin Goldstein of Baseball Prospectus recently got a first-hand look at Sano and came away very impressed. Baseball Prospectus subscribers can read the full scouting report, but the short version is that Goldstein was surprised by the vastly improved patience Sano showed at the plate and was awed by the exceptional power as "his bat goes through the zone violently with plenty of explosion from his mid-section and hips." Goldstein even described Sano's defense at third base as better than expected, although that meant "merely bad" instead of "laughably awful." • Josh Willingham, like Sano, also hit his fifth homer yesterday, taking over the AL lead and joining Kirby Puckett in 1987, Kent Hrbek in 1982, and Bobby Darwin in 1972 as the only Twins hitters with five homers through the first 11 games of a season. So far at least the Willingham signing looks every bit as good as it did at the time, although as a left fielder he makes a good designated hitter. Longtime readers of AG.com may recognize "Player X" as Luis Rivas, who was without question the player who received the most criticism during the first four years of this blog's existence. Rivas was released by the Twins at age 25 and was out of the majors for good at age 28, which is how old Casilla will be in two months. It's time to stop treating him like some sort of prospect with impressive upside. • Trevor Plouffe has now committed 13 errors in 465 innings as a big-league shortstop, which is the equivalent of around 40 errors per full season and a startling number for someone who was a shortstop for 680 games in the minors. That includes 242 games as a Triple-A shortstop, during which time Plouffe made 47 errors. In other words, at this point Plouffe is a shortstop like Michael Cuddyer was a second baseman. He needs to start mashing left-handers. • Last season Twins pitchers ranked dead last among MLB teams in strikeouts by a wide margin and they're back in 30th place again this season with just 54 strikeouts through 11 games. By comparison, Nationals pitchers lead baseball with 117 strikeouts in 12 games. And not surprisingly the combination of the fewest strikeouts in baseball and a sub par defense has added up to MLB's fourth-worst ERA. • In addition to his hitting .293/.383/.415 through 11 games another positive sign for Joe Mauer is that he stole a base Monday night after a grand total of one steal in 219 games during the past two seasons. On the other hand nearly 60 percent of his balls in play have been on the ground, which is a disturbingly high total even considering he's always been a ground-ball hitter. 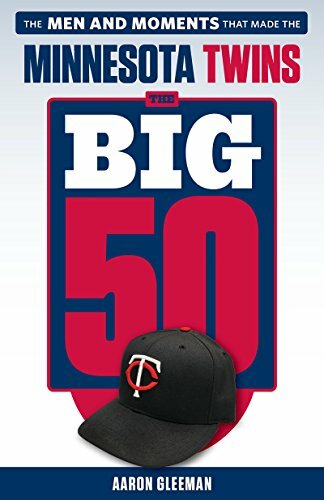 • Mauer isn't alone in his worm-killing, as Twins hitters collectively lead baseball with a ground-ball rate of 55.1 percent. No other team is above 51.6 percent and only two other teams are above 50 percent. And because it's really hard to hit a ground ball over the fence everyone not named Willingham has combined for four homers in 358 plate appearances. • Matthew Bashore, the 2009 first-round pick who was released by the Twins last month after injuries derailed his career, has signed with the Yankees. 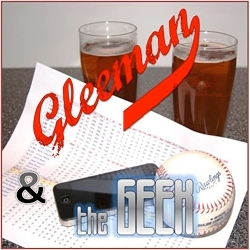 • "Gleeman and The Geek" made its radio debut this week with 70 minutes of non-stop Twins talk, so give it a listen if you haven't already. We'll be live on KFAN again Sunday at 4:00. 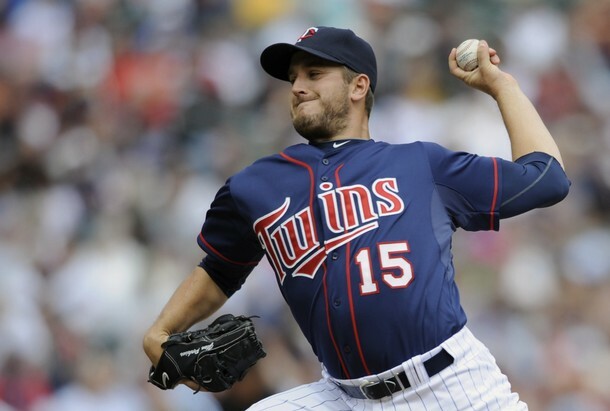 • Two months after avoiding arbitration for this season with a one-year, $1.55 million deal Glen Perkins and the Twins agreed to a three-year, $10.3 million extension that includes a team option for 2016. Perkins would have been arbitration eligible for the final time in 2013, so the extension pre-pays that bill and then covers his first two seasons of free agency while giving the Twins a $4.5 million option or $300,000 buyout for his third season of free agency. Between his 5.06 ERA as a starter and an injury grievance filed against the team Perkins was deep in the doghouse and close to being discarded, but instead he stayed with the Twins and shifted to the bullpen with great success. Perkins wore down late in the season, but that isn't shocking from a 29-year-old working as a full-time reliever for the first time ever and he still finished with a 2.48 ERA and 65-to-21 strikeout-to-walk ratio in 62 innings overall. Perkins wasn't quite as great as his ERA suggested, largely because allowing just two homers in 253 plate appearances isn't sustainable, but his 2.92 xFIP ranked 16th among all relievers with 50 or more innings. And while committing $10.3 million to a 29-year-old with a 4.41 career ERA is certainly risky, Perkins was a completely different pitcher last season thanks to adding 3-4 miles per hour to his fastball moving from the rotation to the bullpen. Obviously waiting to see if Perkins could duplicate that success before making the commitment would have been ideal for the Twins, but another standout year would establish him as an elite reliever and leave him just one season away from a big contract in free agency. Once a player can sniff the open market the motivation to sign a long-term deal often vanishes, so if the Twins believe the Perkins they saw in 2011 is the real deal they did well to sign him now. Perkins will get $2.5 million in 2013, $3.75 million in both 2014 and 2015, and $4.5 million or a $300,000 buyout in 2016, all of which will be bargains if he keeps thriving as a reliever. And while the deal also includes incentives based on games finished to raise those salaries if he becomes a closer, by signing Perkins as a setup man the Twins don't have to worry as much about how racking up saves would strengthen his bargaining power and perceived value. Dozier, a shortstop from Tupelo, Miss., is going to be the next big thing for the Twins. The only question is: How soon is next? ... At the moment, there seems to be no alternative [at shortstop]. However, Twins fans should take comfort in knowing this dire situation appears temporary. Because Dozier has been advancing through the farm system at breakneck speed. Everyone seems convinced that Dozier is the next big thing. Of course, spring training is all about hope. If you can't get excited over a prospect in spring training, heck, you should be watching a different sport. But in this case, I really do think that "next" is going to be pretty darn quick. Powers writes that "everyone seems convinced that Dozier is the next big thing." In reality, Dozier appeared on zero prominent top-100 prospect lists and doesn't even rank as one of the Twins' top seven prospects according to John Manuel of Baseball America or Kevin Goldstein of Baseball Prospectus or Keith Law of ESPN.com. Dozier has the potential to become a solid big leaguer, but the picture being painted by Powers is misleading at best. A true power hitter has a different air about him when he talks about home runs. It's not about getting a good pitch to hit or guessing right on a fastball, but rather it's about a certain feeling that occurs when bat and baseball collide. True power hitters get sort of a faraway look just describing it. "It's some feeling when you know you got it," Chris Parmelee said. "It's a good feeling, a great feeling." And if the ball is going over the fence anyway, it might as well go waaayyy over the fence, right? "Yeah, why not?" Parmelee said with a chuckle. The good news is that he never has lost sight of his best attribute: the ability to hit the baseball a long way. In other words, his role is that of a power hitter. ... Here's a kid who can hit the ball a mile. Put him in the lineup until he shows he doesn't belong there. Powers makes a huge deal about the four homers Parmelee hit for the Twins in September, using them as evidence that the 24-year-old with zero Triple-A experience should be playing every day in the majors, and repeatedly writes things that make it seem as though he's a big-time slugger. Yet not once in the entire 20-paragraph article does Powers mention that Parmelee had just 19 homers and a .416 slugging percentage in two seasons at Double-A. • J.J. Hardy joined David Ortiz in saying that the Twins coached him not to maximize his power potential, although unlike Ortiz he later clarified the comments to be less critical. Whatever the case, the Twins' homer total hasn't been among the league's top five since way back in 1988 and they've ranked 10th or worse 16 times during that span. They've also had one of the league's top five offenses just three times in the past 19 seasons. • Alexi Casilla didn't look awful and graded out decently statistically in 36 starts at shortstop last year, but apparently the Twins weren't impressed. During an in-game interview on FSN last week Terry Ryan said: "We tried Casilla at shortstop a couple times and it didn't really work out." • Kevin Mulvey, who was acquired from the Mets in the Johan Santana deal and then traded to the Diamondbacks for Jon Rauch, has re-signed with the Mets on a minor-league contract after being released by the Diamondbacks. And at age 26 he's little more than Triple-A filler. • California high school right-hander Lucas Giolito is one of the Twins' potential targets with the No. 2 overall pick, but he'll miss the rest of the season with an elbow injury. • Bobby Valentine, who managed Tsuyoshi Nishioka in Japan for six years, says he predicted Nishioka's broken leg and even warned him about it last spring. • Drew Butera has hit .178/.220/.261 in the majors after hitting .214/.296/.317 in the minors, which makes this article pretty hilarious. • Jason Pridie was suspended 50 games after testing positive for a "drug of abuse," which means the Twins probably won't try to acquire him for a third time. • Doug Mientkiewicz, who last played in 2009, is the Dodgers' new rookie-ball hitting coach. • Joel Zumaya is scheduled for Tommy John surgery and will attempt another comeback. • Gary Gaetti's son is marrying Dan Gladden's daughter. • To put the Twins' current 11.5-game AL Central deficit into context consider that they're 15.0 games ahead of the Astros for the worst record in baseball. They're also just 3.0 games ahead of the Royals for last place in the AL Central and 5.5 games ahead of the Orioles for the worst record in the AL. There are 43 games remaining and the Twins would have to go 29-14 just to finish .500. In their last 43 games the Twins are 20-23. • Alexi Casilla spent two weeks on the disabled list with a strained right hamstring and then aggravated the injury in the seventh inning of his first game back Friday, immediately returning to the DL. Trevor Plouffe, who was optioned to Triple-A to clear a roster spot for Casilla, was called right back up and will hopefully get more of an opportunity than last time, when he often found himself on the bench in favor of Matt Tolbert. Plouffe has plenty of flaws and is hardly guaranteed to become a solid big leaguer, but if ever there was a time for the Twins to find out it's when the division title is out of reach and their primary alternative is a 29-year-old career .235/.291/.326 hitter. Using the final six weeks to see if Plouffe can be a part of the team's plans in 2012 and beyond is far more valuable than giving Tolbert more time to cement his status as the definition of a replacement-level player. • Kevin Slowey's long-awaited return to the Twins' rotation technically never happened, as he allowed one run in two innings yesterday before the game was washed away by rain. • Denard Span is 2-for-35 (.057) with nine strikeouts versus three walks since spending two months on the disabled list, telling LaVelle E. Neal III of the Minneapolis Star Tribune that he's still having post-concussion symptoms and is struggling with new medication. Not good. • Justin Morneau returned to the lineup six weeks after surgery to remove a herniated disk fragment from his neck, but told Neal that he still doesn't have feeling in his left index finger because of nerve damage. Despite that Morneau went 11-for-30 (.367) with a homer and four doubles in seven games rehabbing at Triple-A. It's important to note that Tom Kelly used Aguilera much differently than Ron Gardenhire has used Nathan. Nathan has inherited a grand total of 54 runners in seven-plus seasons with the Twins, which works out to one per eight innings. Aguilera inherited 38 runners in his first year as closer, and then saw 37 and 40 more in the next two years. In all, Aguilera inherited 207 runners during his time in Minnesota, which works out to one every 2.5 relief innings. The vast majority of Nathan's saves involved starting an inning with a clean slate, but Aguilera often saved games he entered with runners on base. That goes a long way toward explaining his seemingly mediocre save percentage and Aguilera also deserves credit for stranding more than three-fourths of the runners he inherited. In addition to being more difficult than Nathan's saves, on average, Aguilera's saves were also longer, as he recorded 55 more outs in his 254 saves than Nathan has in his 255 saves. • Glen Perkins might be wearing down in his first full season as a reliever. He allowed eight runs in 43 innings through August 5, including 37 scoreless appearances in 45 total outings, and never gave up more than one run in a game. And now Perkins has allowed six runs in his last four innings, including four straight outings with a run and multiple runs in two of them. David Ortiz's homer was the first served up by Perkins in 178 plate appearances this year. • Amelia Rayno of the Minneapolis Star Tribune wrote an interesting article about the pitcher-catcher relationship and specifically Carl Pavano picking Drew Butera as his personal catcher. Near the end of the article she noted Pavano's respective ERA with different catchers, but it's worth repeating: Pavano has a 4.26 ERA in 35 starts with his preferred catcher, Butera, and a 4.09 ERA in 31 starts with Joe Mauer. And this year's numbers skew further in Mauer's favor. • MLB suspended Twins minor leaguer Kennys Vargas for 50 games after he violated the drug prevention and treatment program by reportedly testing positive for phentermine, which can be used to speed metabolism for weight loss. Vargas is 6-foot-5 and Seth Stohs notes that his weight has been an issue. Vargas, a 20-year-old first baseman who was signed out of Puerto Rico in 2009, was hitting .322/.377/.489 in 44 games at rookie-level Elizabethton. • Ted Uhlaender is the only outfielder in Twins history to get 200-plus plate appearances in a season with an on-base percentage below .300 and a slugging percentage below .300, hitting .226/.280/.286 in 403 plate appearances in 1966. Ben Revere is hitting .245/.294/.285 in 298 plate appearances. And his noodle arm was in right field Wednesday because Ron Gardenhire refuses to move Delmon Young there. Don't mess with success. Or something. How silly. • Jim Thome has faced three pitchers at least 70 times in his career. One is Tim Wakefield, whom he faced last week, and the other two are Roger Clemens and Brad Radke. Thome has hit just .185 off Wakefield and .225 (with good power) off Radke, but crushed Clemens to the tune of .355/.438/.855 with eight homers and seven doubles in 62 at-bats. Among all hitters Clemens faced at least 50 times Thome is the only one to top a 1.000 OPS. And he's at 1.293. • Tonight is the deadline for MLB teams to sign draft picks and the Twins' first-rounder, North Carolina junior shortstop Levi Michael, remains unsigned, as do supplemental first-round picks Travis Harrison and Hudson Boyd. Their next six picks are all signed. • While watching Tom Kelly fill in for Bert Blyleven during one of the recent FSN broadcasts I looked up his old minor-league numbers and the former manager hit .272/.406/.436 with more walks (538) than strikeouts (429) in 782 games at Triple-A. Of course, he was a first baseman, which is why Kelly spent 13 seasons in the minors and 47 games in the majors. Offensively at least he was a poor man's Doug Mientkiewicz. • Why was Chuck Knoblauch a no-show at the 1991 team's reunion last week? Because "he's considerably out of shape," according to Charley Walters of the St. Paul Pioneer Press. Which is smart, because Kent Hrbek would have really goofed on him.